Si Ping High School is having a fund-raising event to fund for the ingredients to cook for Ming Dao Elementary School. In amongst this event, Han Jie’s identity of Oscar Han is finally made known to Fang Xiao Rou and the students. A love triangle seems to be on the horizon upon the entrance of the renown international chef, Cindy Yao—an admirer of Oscar Han. And a mysterious ghost in the kitchen of Si Ping High School has rumours spread and everyone scared. In the previous episode, Fang Xiao Rou asks Han Jie why he’s saying he’s sorry. Following on from this, we see Han Jie just staring up at Fang Xiao Rou’s waiting eyes. Han Jie decides he can’t bring himself to explain and brings himself to gaze below him. This has Fang Xiao Rou begin thinking about the confession that she just can’t remember, but has a possibility of having happened in her drunken state. “The reason you’re sorry can’t possibly be because…” Fang Xiao Rou can’t complete the question of asking if it is because he’s sorry for the rejection she believes happened. Finding no reply from Han Jie and seeing him look back up and gazing at her, Fang Xiao Rou confirms to herself that his apology must be due to a rejection to her confession. “I know,” Fang Xiao Rou says. Begin the misunderstanding between the two now. “You know,” Han Jie responds—a statement laced with question in his tone. Fang Xiao Rou nods with a sad expression on her face. Li Zhi Chao enters at this point and expresses that he’s bothered. Jiang Pei Ying is in tow, complaining of the drizzly rain and comes running in to take shelter underneath the umbrella sheltering Fang Xiao Rou and Han Jie. Li Zhi Chao doesn’t end up with the information he wants with Jiang Pei Ying bringing the topic to a close with a push for Li Zhi Chao to apologise once more to Han Jie for the headbutt. Han Jie, he’s unimpressed with Li Zhi Chao and turns his chair away to get him out of his sight after Li Zhi Chao apologises. A rumour of a ghost present in Si Ping High School spreads after two female students visited the school at night and had heard the sound of a knife being sharpened. This rumour begins a ghost story told by Tang Hao to his fellow students. This ghost story is simply an altered and darker version of Han Jie and his old cooking teacher’s story where the student felt so guilty for the accident he chopped his own hand off and died from excess loss of blood. The following scene of the food and beverages students counting inventory seems to show and suggest that the ‘ghost’ could possibly be Ma Chong Sheng being studious late at night at school. When Amy Fan informs Fang Xiao Rou that some ingredient quantities are not matching with those on her inventory list, Ma Chong Sheng has a very guilty look on his face. There is a short scene of the food and beverage students in the school training kitchen cooking. We see Han Jie giving them the task of coming up with a breakfast dish using eggs as the main theme. Following this, a sequence of scenes has Han Jie’s famous status in the culinary world as Oscar Han of renown restaurant, Olives House, becoming common knowledge to Fang Xiao Rou and the students. It also brings in a love triangle into the plot. It begins with Fang Xiao Rou visiting Ma Chong Sheng’s grandmother at her noodle shop to check up on how she’s doing. This visit is in light of the event that happened in Episode 3 where Ma Chong Sheng was seen running his grandmother’s noodle shop alone because his grandmother had fallen sick and had gone to the hospital. Fang Xiao Rou and Han Jie had turned up looking to bring Ma Chong Sheng back to school, but ended up helping Ma Chong Sheng cook for his patrons. Fang Xiao Rou greets Ma Chong Sheng’s grandmother and asks if she’s doing a bit better. Ma Chong Sheng’s grandmother—a relatively young-looking grandmother who could easily be seen as being from an affluent area of town with her styled hair and flawless makeup—is appreciative for Fang Xiao Rou’s concern and care. She thanks Fang Xiao Rou with a wide and cheerful smile. Ma Chong Sheng’s grandmother seems to be a popular person today because Han Jie and Raymond are also at the noodle shop—however, they are out of sight presently when Ma Chong Sheng’s grandmother expresses thanks for the help she’s received from the teachers. She expresses how she’s embarrassed for troubling them. Fang Xiao Rou shyly takes the thanks and says she didn’t do much, thinking Ma Chong Sheng’s grandmother was talking about her. However, as Ma Chong Sheng lets Fang Xiao Rou know, the thanks isn’t for her, but another. “Oh. Not me? Then who?” Fang Xiao Rou asks in surprise. Enters Han Jie and Raymond, appearing through a door adjacent the service area. “Han Jie, why are you here?” Fang Xiao Rou asks. “I was in the area. Seeing Grandma was unable to handle the busy load, I helped her with the noodles,” he explains. Han Jie’s unexpected kindness has Fang Xiao Rou astonished— “For real?! You really are kinder than you appear!” The compliment within the criticism has Han Jie briefly and playfully miffed before he receives it, thanking Fang Xiao Rou. After Fang Xiao Rou gets acquainted with Raymond as a partner of Han Jie’s, the conversation moves onto a talk about Ming Dao Elementary School when Han Jie enquires about the fair amount of ingredients still left in Ma Chong Sheng’s grandmother’s store room. The extra stock is for the voluntary work for the football team of Ming Dao Elementary School. Ma Chong Sheng tells Fang Xiao Rou and Han Jie that Ming Dao Elementary School is a school that is underfunded and children there are lacking nutrition. His grandmother being moved by the coach of the football team running around looking for sponsorship, she volunteers her cooking services to help out. This talk about Ma Chong Sheng’s grandmother cooking for Ming Dao Elementary School gives Fang Xiao Rou an idea. She makes a suggestion to Han Jie to have the students go with Ma Chong Sheng’s grandmother this time and volunteer. She explains that it can give training to their students in catering for a large group. Han Jie sees the benefit and agrees. Catering for Ming Dao Elementary School then becomes the focus of the remainder of the episode. Before this though, Fang Xiao Rou finally becomes acquainted with the fact that Han Jie is the famous chef, Oscar Han, of the renown restaurant, Olives House. She is also made to be acquainted with Cindy Yao (Amanda Chou)—the renown chef supervising Shi Wen High School into the competition against Si Ping High School. She is also someone very familiar to Han Jie! After finishing up at Ma Chong Sheng’s grandmother’s noodle shop, Fang Xiao Rou heads to a kitchenware store to look for a new stir fry pan for her father. She had asked Han Jie along to help her as he is familiar with what good kitchenware is. Fang Xiao Rou is taken aback by the unexpected response. At that moment, Han Jie seems to have come up with a way to show his appreciation to Fang Xiao Rou: keeping his eyes on Fang Xiao Rou, he brings his hand up and brings it to Fang Xiao Rou’s right side. Fang Xiao Rou, she’s getting more and more dazed. It’s getting closer and closer to her right cheek—until finally, she sees that Han Jie isn’t actually going for her right cheek. His hand passes her and she sees the hand come back holding a stir fry pan that was displayed on the shelf above her head behind her. Yes, Han Jie seems to have made Fang Xiao Rou believe he was going to show his appreciation with an affectionate gesture; but, it was just another opportunity he happened to find for another playful tease on her. Poor Fang Xiao Rou! We wonder how many more teases Fang Xiao Rou will have to endure and be made to look like a fool. Meanwhile, Han Jie has fun. There’s something like karma, though, with the fact that he is Fang Xiao Rou’s father’s former culinary student that she hates; and there’s Wen Zhen Yu who can be used to start getting Han Jie to turn his teasing affectionate gestures into real and sincere ones! Han Jie chuckles as he tells Fang Xiao Rou that the stir fry pan he has in his hand is pretty good. “It’ll be this one then,” Fang Xiao Rou says then snatches the pan out of Han Jie’s hands. Han Jie responds with an amused smile. This beautiful and stylish woman with a cute feminine voice is Cindy Yao. Seeing her and recognising her, Han Jie zips towards Cindy Yao and greets her in the European way of greeting—kisses from one cheek to the other cheek. This greeting throws Fang Xiao Rou many steps back, not used to seeing such greetings. Raymond shows up also. He greets Cindy Yao as well. It is a lively circle of seemingly well-acquainted friends catching up back in their home country. Fang Xiao Rou has not noticed the address this Cindy Yao has used for Han Jie. She’s only wondering where she has heard the name Cindy Yao. It takes her a moment to place the name and remember that she is Yao Xin Ti—the one Su Ying Jun had mentioned as the renown chef helping Shi Wen High School into the Universiade against them. Cindy Yao is Senior’s former classmate. Immediately, Fang Xiao Rou heads to the circle with Cindy Yao in it. “Excuse me,” she says to Cindy Yao. “May I ask whether you are the classmate of Wen Zhen Yu?” I am, Cindy Yao replies. The beautiful chef then asks Fang Xiao Rou for her name in return. 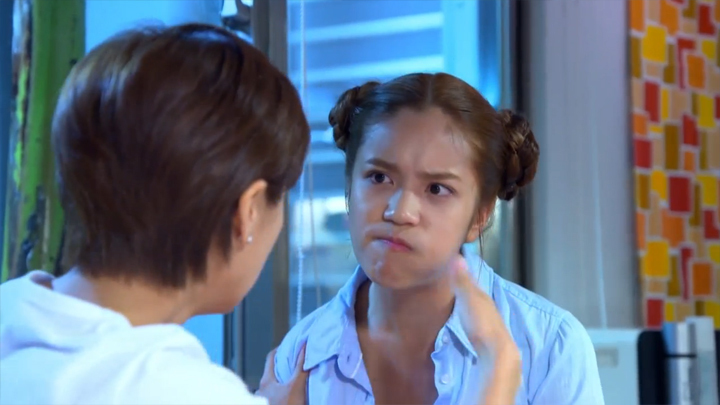 Fang Xiao Rou is in the process of introducing herself, but Han Jie interrupts her and takes the task of introducing Fang Xiao Rou to Cindy Yao: “This is Fang Xiao Rou. She is my colleague.” Han Jie then returns the gesture to Fang Xiao Rou and introduces Cindy Yao to Fang Xiao Rou and explains that Cindy Yao has come back to be Shi Wen High School’s guest instructor. For the second time today, Han Jie has made Fang Xiao Rou look like a fool as she recalls the time she was talking to Han Jie and giving him information on Oscar Han’s Olives House after seeing Olives House’s website on Han Jie’s computer screen (seen in Episode 1). Fang Xiao Rou kicks herself from embarrassment. She then gives a good strong hit to Han Jie’s arm. “Why didn’t you tell me? !” Fang Xiao Rou exclaims. Hmm… when that hand of Fang Xiao Rou’s landed on Han Jie’s arm, we thought Han Jie would’ve displayed a hint of annoyance to it like how he had with ones in the past, but Han Jie takes it—seen grabbing his arm, saying it hurts, a guilty smile across his lips and chuckling. “It’s not a big deal. Cindy is also an excellent chef. She’s the executive chef of Ceres restaurant,” Han Jie defends himself. Fang Xiao Rou is indeed shocked by the information, but she has enough calmness to look composed. Is that true, Fang Xiao Rou asks Han Jie. Typical response of Han Jie, he returns a question to Fang Xiao Rou’s question— “What do you think?” Fang Xiao Rou isn’t certain what’s true and what’s not. She just looks at him, uncertain. While Han Jie continues a light and fun talk with Cindy Yao after Han Jie asks Cindy Yao if she’s stalking him or not, Fang Xiao Rou exits the circle that suddenly turned her into something like a third wheel (Raymond seems to have exited some time in the conversation as he isn’t found in the shot). 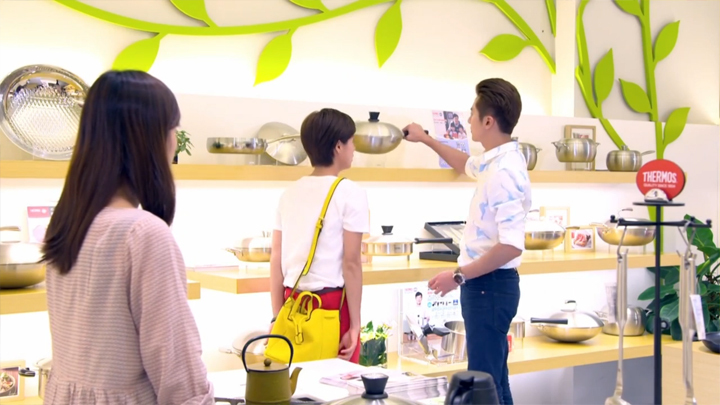 Fang Xiao Rou returns to the cashier counter to pick up her purchased item—the stir fry pan that Han Jie had offered to pay for and gift to Fang Xiao Rou’s father, but didn’t end up doing. Fang Xiao Rou turns back to look in the direction of Han Jie and Cindy Yao happily chatting with each other, sadness apparent in her expression. The whole news about Han Jie being Oscar Han—but more so, Han Jie and Cindy Yao, has Fang Xiao Rou affected a lot. Fang Xiao Rou seems to have a very dark rain cloud following above her head as she drags her feet down the stairs and into the empty lounge of her apartment. “I’m home,” she announces with effort before she plops the things she has in her hands down onto the couch and does the same with herself. Fang Xiao Rou stares blankly into space with a long face and expresses a heavy sigh. Jiang Pei Ying comes sitting down next to Fang Xiao Rou with a strange facial mask. When Fang Xiao Rou turns to answer Jiang Pei Ying’s question of, “What’s wrong?” and sees Jiang Pei Ying’s facial mask, it scares her. A lot of life is seen going back into Fang Xiao Rou when she tells Jiang Pei Ying off for coming in with such a weird thing on ghost month (15th day of the seventh month in the lunar calendar). But when Jiang Pei Ying tells Fang Xiao Rou off in turn for being the weird one for not noticing sooner, Fang Xiao Rou returns back to her spiritless state, plopping herself down and sideways onto the couch. Jiang Pei Ying calls for Fang Xiao Rou to get back up. When she doesn’t, Jiang Pei Ying pulls Fang Xiao Rou’s uncooperative body back upright. You must have seen a ghost, Jiang Pei Ying says to Fang Xiao Rou, believing this must be the reason for her friend looking so spiritless. No, Fang Xiao Rou says. She met someone else—a legendary person from the European culinary world. “Did you know that Olives House’s boss, Oscar Han, is Han Jie?” Fang Xiao Rou asks Jiang Pei Ying. “No way!” Jiang Pei Ying exclaims. This exclamation is not due to Jiang Pei Ying’s disbelief towards Oscar Han being Han Jie. Rather, it’s disbelief towards Fang Xiao Rou’s lack of knowledge of it. “You only realise that now? !” she says to her. What is not common knowledge to Jiang Pei Ying, though, is the fact of Han Jie having a fiancée. She’s Cindy Yao, the supervising teacher for Shi Wen High School for the cooking competition, Fang Xiao Rou informs Jiang Pei Ying. This has Jiang Pei Ying surprised and then worried when Fang Xiao Rou rejects all the possible shortcomings of this fiancée of Han Jie’s that she comes up with: she must be a bit ugly; a bit fat; very Taiwanese; seriously schemy. No, she’s beautiful; slim; has come back from Europe and has great qualities. Fang Xiao Rou tells Jiang Pei Ying to stop trying to find faults because she’s poised and confident. The next day, it’s the students to find out Han Jie is Oscar Han. Ma Chong Sheng reading a book with Cindy Yao on the cover sparks a conversation on Cindy Yao’s accomplishments. Oscar Han is then brought up into the conversation as a student informs that Oscar Han has been noted in a culinary magazine as the Asian chef with a high profile in the culinary world and is someone who was once voted as the most outstanding chef. Another student expresses that being featured in a culinary magazine is nothing impressive. But as Wang Mai Zhi informs them, Oscar Han has also appeared in Elle, Times, and New York Times. This has Ma Chong Sheng and others wishing to see how this impressive chef looks like. As Fang Xiao Rou shows us when she comes into class and takes a look at Ma Chong Sheng’s book with Cindy Yao on the cover—if only Ma Chong Sheng read a little further into the book he would have been the first one in his class to see a picture of Oscar Han—his teacher—in it. Fang Xiao Rou reading a page on the book describing Cindy Yao and Oscar Han as highly skilled and with an impressive reputation in the culinary world has Ma Chong Sheng expressing his concern about competing against last year’s winner who is now more unbeatable with such an outstanding chef as Cindy Yao helping them in the competition this year. And finally the students click on. We see students around the class getting out their phones and begin a search online— “So, Olives House’s Oscar Han is Han Jie? !” Wang Mai Zhi asks. Yes, indeed. We finally come to preparations on charity cooking for Ming Dao Elementary School. The students are in the school kitchen training room seated for a discussion session. Han Jie has finished writing the recipient of their charity cooking and turns to the class. “Are there any questions on what I’ve just said,” Han Jie asks them. No one has questions on the topic at hand; only questions for the famous chef, Oscar Han. In reporter style, all except Ma Chong Sheng who had the question of why Han Jie chose to give up Olives House to come teach them, had a question about his relationship with Cindy Yao. Han Jie must be thinking Fang Xiao Rou had spread the idea that he and Cindy Yao are an item because we see him turn to Fang Xiao Rou for an explanation to this unexpected and unusual behaviour of their students: “Why are they so enthusiastic?” he asks Fang Xiao Rou. They are young kids who are simply curious, Fang Xiao Rou replies. Han Jie seems to love to phish for Fang Xiao Rou’s personal thoughts, feelings and opinions on matters concerning his personal life because the next question he has for Fang Xiao Rou is: “What about you? Are you curious?” Fang Xiao Rou is taken off guard, but she is quick in her defense and comes up with asking why she’d be curious about his matters; then averts her eyes. Again this gains her a chuckle from Han Jie and an ‘Okay…’ as a response. Fang Xiao Rou is curious, though. Along with the students, she gets disappointed when Han Jie’s response turns anti-climatic: “Cindy and me…” Han Jie pauses, “this is none of your business.” He will only answer questions about the charity cooking for Ming Dao Elementary School, Han Jie says to the class. Class immediately resumes back to discussion about the charity work. However, it is not the type of discussion Han Jie had in mind. The students aren’t enthusiastic and looking for easy ways to complete the voluntary project. When Fang Xiao Rou tries to have the class see how great this opportunity is for them, moans, groans and annoyance is all that comes from them. It takes a serious lecturing and scolding from Han Jie for the students to be serious and begin a good session of brainstorming to come up with ideas to raise money to fund the voluntary project. The brainstorming sees the idea of making love-themed food items such as pancake pops, macarons, madeleine with customised decorations, crêpes and heart-shaped biscuits. It is time for the fund-raising event. Some students head out and walk around with a basket of their creations, inviting people to purchase while some are stationed at a vending booth with their creations on display for sale. Sales are slow at the vending booth. The only ones getting sold are the ones near Han Jie or the ones he touches. Those students who went out into the public is even slower. They come back from their rounds and report no one wanting to buy anything. Fang Xiao Rou isn’t discouraged by the situation. She tells her students that they just simply need to come up with another way to attract people to buy their items. Ma Chong Sheng comes up with the idea of doing a dance. Dances always attract a crowd, he says. Once they gather a crowd, they can invite them to buy their items, he adds. The idea gets executed. The students group dance on a platform stage. It seems Ma Chong Sheng has observed right: their dance has gathered a crowd around them. However, as soon as the dance is over and they invite people to buy their items, it’s only declines. Hmm… Han Jie asking this, there’s only two reasons we can come up with for this hesitation: either he’s concerned that it will have an impact on Cindy Yao’s image in the culinary world—she is famous, after all, unlike Fang Xiao Rou who can be utilised without having any impact on her image but his own image—which we assume he’s fine with—or, it’s that he, himself, doesn’t want people to misunderstand that he and Cindy Yao are an item. Though it can easily be the latter where Han Jie is not wanting to be misunderstood as being in a relationship with Cindy Yao and is okay with being misunderstood as being in a relationship with Fang Xiao Rou since he was the one who suggested the idea to pretend to be a couple with Fang Xiao Rou—it can also easily be that he’s worried about it having an impact on Cindy Yao’s image for the above-mentioned reason. We want to believe it’s because Han Jie doesn’t want people to think he and Cindy Yao are an item—but, who knows? “Oscar! Here, today, I have something that I must tell you.” Han Jie, he smiles and waits expectedly for her confession. “And that is…” Cindy Yao pauses; then, at the top of her lungs, she does her grand finale: “I like you! Je t’aime!” Han Jie smiles and nods on a good job well done. Claps and cheers come from the crowd. Ma Chong Sheng, the uninformed bystander watching on what he believes is a real confession, goes up to Han Jie and provides him a macaron. “Teacher, eating this macaron means you accept her love.” Han Jie hesitates, but with the crowd spurring him on with their chants for him to eat it; Cindy Yao nodding her head for him to do so, too; and there must also be the thought of eating the macaron being in his best interest if he wants the class to sell their food items circling around his head, he takes the macaron and eats it. Cindy Yao comes down from the stage and hugs Han Jie. Ma Chong Sheng’s actions helped their cause more and saw a rush of people heading to them to buy their items. However, he didn’t help his teacher, Fang Xiao Rou. Watching Han Jie with Cindy Yao and seeing the bustling activity of the crowd all wishing to buy their items all thanks to two talented and acclaimed chefs, and two perfectly matched individuals, Fang Xiao Rou is looking depressed (and most probably inferior). There is a feel of a professional kitchen as Han Jie assigns each of his students their task in the kitchen. “Yes, Chef!” the students repond to the orders and they all move to begin their tasks. But however professional the students sound and look, their skills fall far short of it. The inexperienced culinary students are cutting the food items wrong and awkwardly, are boiling vegetables that need to be fresh and cooking pasta to the point of being too soft. Things are not going well. The students start to buckle under Han Jie’s increasing frustration as he scolds them at every turn. Han Jie is becoming more and more aggressive in his management of his students as time ticks by. Twenty-nine minutes left and watching Wang Mai Zhi continuing to cut the chicken leg on his chopping board awkwardly, Han Jie snaps. Han Jie slams his hand on the countertop then walks to Wang Mai Zhi’s station. He forcefully shoves Wang Mai Zhi aside and begins cutting the chicken leg. After a few cuts, Han Jie takes a cut and holds it up in front of Wang Mai Zhi’s eyes. “This is the size I want,” Han Jie tells him. He then chucks the piece of meat onto the chopping board. Students jump with fright from the harsh action. Han Jie walks off without any further words. 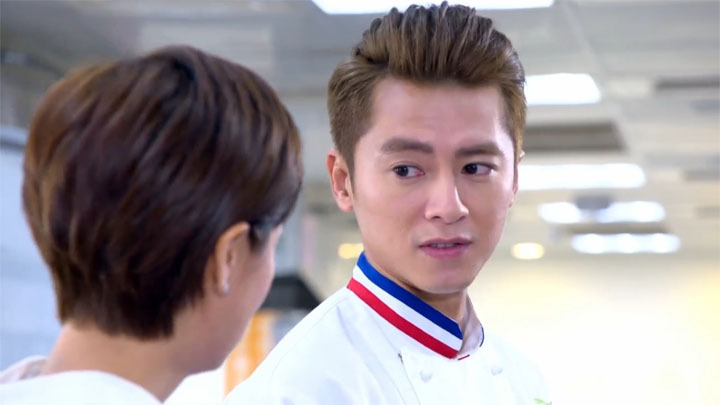 Han Jie may have gained Wang Mai Zhi’s respect after finding out Han Jie is the famous chef, Oscar Han; however, he is still proud and stubborn. The rude action of Han Jie’s has him lash out: “Last time it was Running Man. This time it’s Hell’s Kitchen!” he says as he angrily cuts the meat with his cleaver. The students remain in low-spirits and are hesitant to continue. Fang Xiao Rou turns to Han Jie who’s standing behind her and far away from the group. He turns his head left to avoid her eye contact. Fang Xiao Rou goes over to him and stands before him. Her soft gaze tells him to not be angry with their students and come over to encourage them. Some students look with an expectant look while others look away and down when Han Jie moves his gaze to them. He’s too unhappy with them. He won’t bring himself over to his students to encourage them. Students and teacher now working together, the kitchen is running smoothly and the food is served to the children without problems. A special request from a boy who’s birthday is today requests Han Jie to make him something his mother used to make—a dish with fried noodles, egg and sesame oil. It has a crunchy texture, too. With the ingredients he has in the kitchen, Han Jie comes up with a special dish similar to it—a Taiwanese style angel hair pasta with sesame oil for the birthday boy. The event is a success and sees Ma Chong Sheng, Amy Fan and Liu Xuan thanking Han Jie for his supervision and even expresses their appreciation for his strict teachings. Wang Mai Zhi, he gives credit to Fang Xiao Rou, who he believes also helped: he goes over to Fang Xiao Rou and takes hold of her left hand. His friend also goes over to Fang Xiao Rou to take her other hand. Both lifts her arm up into the air and gives Fang Xiao Rou three cheers. The event ends off in fun and on high spirits as the male students, Fang Xiao Rou and Han Jie participates in a football match against the school’s football team which sees some cute, funny and competitive moments between Fang Xiao Rou and Han Jie. And there’s an unexpected kiss between Ma Chong Sheng and Wang Mai Zhi! Night has fallen and we are back at Si Ping High School. Fang Xiao Rou is seen at her desk in a dim room. A call from Jiang Pei Ying comes through wondering why she isn’t home, yet. She had played football with some kids and is working on some notes for the Universiade, Fang Xiao Rou tells her friend. After Jiang Pei Ying asks Fang Xiao Rou to help her get some fried chicken and pearl milk tea and the call ends, Fang Xiao Rou gets back to work. Fang Xiao Rou now hears footsteps and they are coming from behind her. She brings the files and folders in her hand closer to her. Imagination is getting the better of her. It isn’t anything scary. It’s just someone walking down the corridor behind her—someone with stylish sneakers. From the look of the sneakers, they belong to Han Jie. But for Fang Xiao Rou, she doesn’t want to know what is behind her, too afraid to find out. She can’t take it anymore. She must get out to safety. She gets moving, her walking pace—speedy. This episode was very Han Jie-centric with Oscar Han’s world being the focus of this episode. It brought in great developments. It’s no wonder it felt like the episode went by much too fast. It was so exciting to finally see Oscar Han being made known to Fang Xiao Rou and the students. It was very surprising to find out that Jiang Pei Ying knew about this fact, though. It makes us wonder if any other characters knew as well. Does Su Ying Jun know? With the appearance of Cindy Yao, we can see the great drama that her character will bring! But, gosh!—was Cindy Yao’s entrance into the story making the moments with Cindy Yao, Han Jie and Fang Xiao Rou so ARRGGGH! in this episode or what?! Our rational and calm mind actually went out the window in this episode. All the scenes with Fang Xiao Rou, Han Jie and Cindy Yao, we wanted to pull Fang Xiao Rou out from the group and move her to somewhere away from Han Jie because we were so annoyed at Han Jie for not noticing the affect he had on her mood when he’s so chummy with Cindy Yao. We were annoyed with the scene at the kitchenware store. The part where Cindy Yao tells Fang Xiao Rou that she has a title that’s more important than the title of Executive Chef of Ceres restaurant to which was Han Jie’s Fiancée, we were furious that Han Jie just looks at Cindy Yao with a huge grin of amusement from her playfulness. It’s not Han Jie not correcting Cindy Yao that made Han Jie infuriating, but it’s more the playful personality that finally got to us, especially when only moments ago he played with Fang Xiao Rou’s mind and heart with the eye contact and hand trick, making her believe he was looking to do something affectionate. That made her a fool and with the entrance of Cindy Yao, it allowed Han Jie to make her feel really bad. Another thing in this scene, when Fang Xiao Rou is about to introduce herself to Cindy Yao after Cindy Yao wonders who Fang Xiao Rou is in return and Han Jie interrupts Fang Xiao Rou from introducing herself to Cindy Yao and takes over the task himself—this even got us annoyed at him. We can see that this action of Han Jie’s is probably because it’s courteous to do so and it’s rude not to do so, but Fang Xiao Rou had already started. Let her finish and allow her to acquaint herself with Cindy Yao! Yup, we were immediately high-strung upon the entrance of this Cindy Yao and was noticing and nitpicking everything Han Jie was doing! It’s a build up from all the teases he played on Fang Xiao Rou throughout the five episodes! We just snapped! >:o( >:o( Haha. :oP :oP. We forgot all about our annoyance with Han Jie in the following scenes until the charity snack sale came around. When Cindy Yao entered into the scene to help Han Jie out with pretending to be a couple so to stimulate sales that were not going so well after Fang Xiao Rou was reluctant to do it—yup, we got annoyed and lost it again. We got annoyed knowing that Fang Xiao Rou was watching the scene where Han Jie accepted the macaron that was a token of him accepting Cindy Yao’s confession and then hugging each other so happily. It was all an act—it’s supposed to look very real and have bystanders believe that what they see is a real confession that turned out very well so to get them to buy the students’ food items, but it was frustrating to see Fang Xiao Rou watching the one she likes so clueless that she was feeling so crummy. Cindy Yao, if she annoys us, it’s only because of how Han Jie interacts with her rather than Cindy Yao herself that annoys us. We find Cindy Yao actually quite a lovable love rival. She is so free and easy, fun and has a cuteness about her. She actually fits Han Jie well. We like her also because she can actually win against Han Jie’s playfulness because—from the looks of it—Han Jie doesn’t actually like Cindy Yao in that way and Cindy Yao is showing that she’d accept Han Jie if he accepted her. This means, unless Han Jie doesn’t mind Cindy Yao misunderstanding, he can’t go too far with playing and teasing. Han Jie and Cindy Yao, they actually feel like they have a sibling-like relationship. This pretend confession, Han Jie accepting the confession, it was an act, but the students would see it as real, right? They weren’t in the loop of the plan, so they would only believe that Han Jie and Cindy Yao are an item. What will this mean for the romance plot? What will come from this? Fang Xiao Rou’s nuturing and supporting nature really stood out in this episode. Fang Xiao Rou’s nuturing and supportive nature was vital in stopping the voluntary cooking event going down the path of disaster. This scene was nice character development for Han Jie and solidifies Fang Xiao Rou as a very useful person in difficult times with her uplifting, nurturing and supportive person. And we love the cliffhanger in this episode. It’s a very funny one and we can’t wait to see what comes from it! We’re excited!! Read our translations for Behind the Scenes of Love Cuisine, Episode 5!